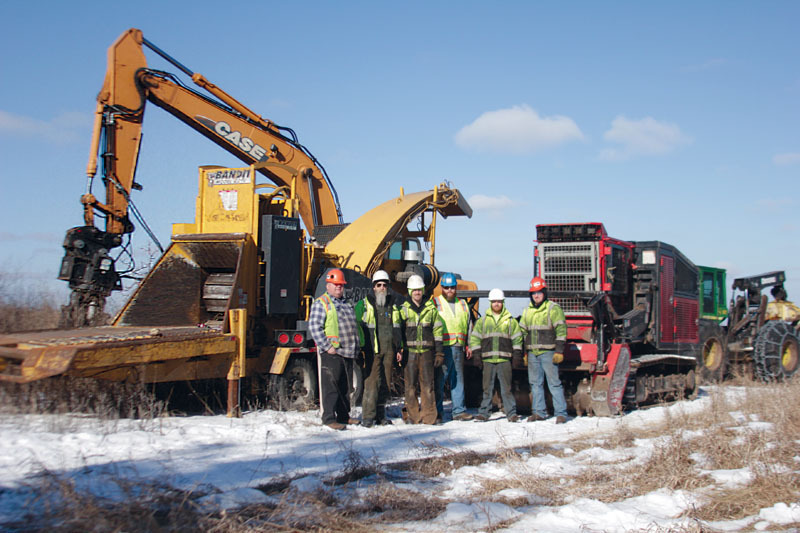 MINNEAPOLIS—The Collins clan at Castle Rock Contracting and Tree LLC have things figured out. 57-year old Perry Collins calls the shots. His wife Mary handles the paperwork. Eldest son Matt already has 15 years with the company, while younger twin sons Andy and Tim continue to bring fresh energy to the team after nearly 13 years on the clock. As Perry says, they all form the backbone of the company, serving commercial customers in roughly a 200-mile radius from their headquarters in Castle Rock, Minnesota, barely 40 miles south of Minneapolis. Accompanied by a workforce of approximately 16 people and aided with an impressive array of equipment, there really isn’t a clearing or removal project this company can’t handle quickly and efficiently. Sure, every company says that to some degree, but Castle Rock has a properly impressive fleet to back up that claim. 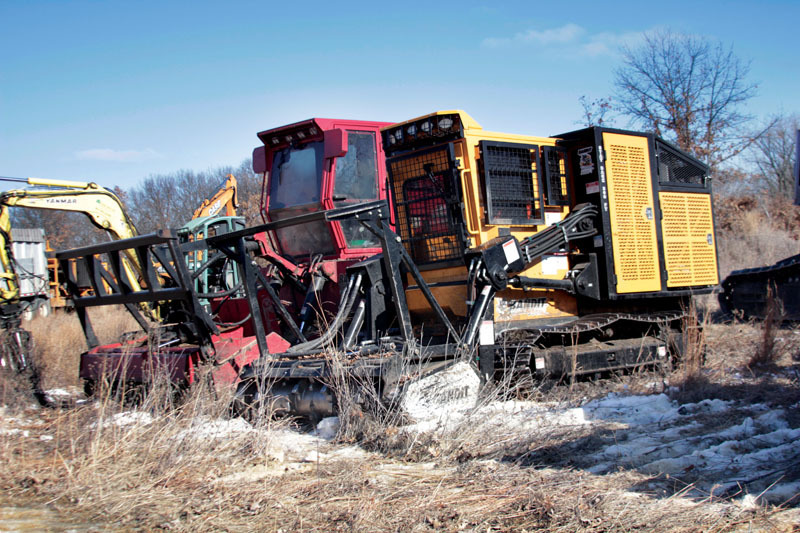 Among the many feller bunchers, skidders and semis used by the crews are enough Bandit machines to start a dealership, ranging from stump grinders to big chippers and forestry mowers. So when Perry says they can handle any project from start to finish, that’s absolutely no exaggeration. It’s no wonder the municipal contracts just keep coming. Of course, their secret to success isn’t as simple as just being a good family business with good equipment. But it isn’t exactly a complicated process either. Talking with Perry, the premise for success is really just hard work and honesty. And when Perry says he’s been that way his whole life, that’s no exaggeration. He had his own pickup truck at age 12, and was driving a semi pulling a chipper at age 13. 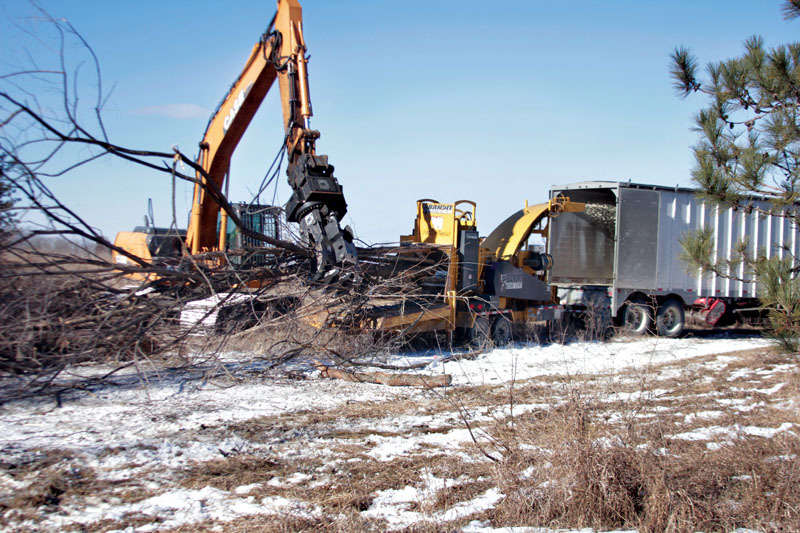 Today Perry can pick and choose from all kinds of equipment, including three Bandit Model 3400 stump grinders and a trio of whole tree chippers—a Model 2090, Model 2290 and Model 2590. He also runs a trio of Bandit forestry mowers—a Model 3500, Model 4000, and his newest acquisition, a Model 3000. I’ve been running Bandit for the last 10 years or so . . . obviously I have a lot of Bandit stuff; it’s just good equipment and they really treat me well. Everyone being happy is without question a big priority for Perry, from his customers to crew members. He’s made it a point over the years to create a positive work environment for employees by offering good wages and full benefits. Castle Rock belongs to the International Union of Operating Engineers Local 49, and Perry is very proud to be a union operation. Again, for Perry it boils down to a simple philosophy that many other companies seem to miss—take care of your employees and they will take care of you. So then, Castle Rock has a strong family backbone, a dedicated crew that’s treated well, and a whole host of Bandit equipment at their disposal. This is already a winning combination, but Perry goes a step further by tackling some of the more complex municipal projects that typically come with specific requirements and mountains of extra paperwork. Perry says many companies simply aren’t willing or able to handle these extra steps, so Castle Rock gets the nod. As a result, the vast majority of Castle Rock’s work is municipal—highway right-of-way, sewer easements, road construction, trail construction, everything from city projects to job for the Department of Natural Resources. Commercial housing development and Ag clearing rounds out Castle Rock’s résumé. It’s a welcome shift from a few years ago when the company was exclusively in the housing market, which as everyone knows went through a slight rough period for awhile. I got the forestry mowers because I’ve had such good luck with Bandit on the stump grinders and chippers, and they’re working fine. That’s also where the fleet of Bandits come in handy. With the capability to cut, chip, grind or mow, Perry and the Castle Rock crew can be a true one-company clearing solution for municipalities. That simplifies the paperwork and procedures for the customers, and for Perry it adds to the payday. On the chipper front, Perry has observed many changes in machine design and operation over his 30-year career, with his current run of Bandits being the best units he’s had. “I grew up with other manufacturers’ machines, with levers all over the place and you needed a semi to pull them,” he explained. “It probably took an hour and a half or even two hours to fill a trailer. Once I started running the Bandit 1890 and 2090, they could be pulled with a one-ton truck and fill a trailer in under an hour and they don’t break down as much as those other machines. Now, my problem is having enough trucks on hand to keep up with the chippers. I have a 2590 that fills trailers in 20 to 30 minutes. Between all these chippers I don’t have enough trucks to keep up—and I have a big fleet of trucks! Wood chips are sold to area power plants and also to landscape companies. Even stump grinding chips and mulch are utilized. In fact, Perry says Castle Rock has virtually nothing left over from their projects—from chips to slash and logs. There are several witty clichés that could be used right now to describe the philosophy behind the success of Castle Rock Contracting and Tree LLC—waste not want not, work hard play hard, and so forth. But such phrases often come across as hollow or artificial, seldom doing justice to the actual subject. The truth is that Perry Collins and his family have built an amazing, successful company that supports their community; one that provides good jobs to good people; one that delivers good service to customers. There is no cliché here, no complex business plan. You get up in the morning, put in a solid day of work, follow the rules, and take care of the people you work with. In a business climate that’s increasingly competitive and complicated, many people seem to forget the basics—just work hard and be good to your people. Perry hasn’t forgotten this, and it shows in his company. And of course, it doesn’t hurt to have a fleet of big Bandits to help out. “I have a lot of equipment, and I’m not saying Bandit is perfect—nobody is,” said Collins. “But they’ve always come through for me. They’ve always worked with me, worked to make everyone happy. They will east costs to make things right, and that’s how it’s supposed to be. 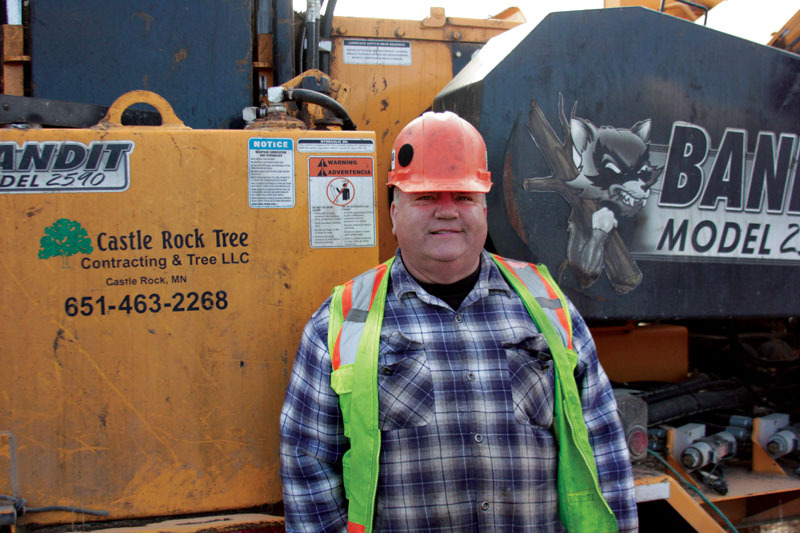 Do that for 30 years, and you’ll have an operation like Castle Rock Contracting and Tree LLC—where family isn’t just the backbone of the company, it is the company.